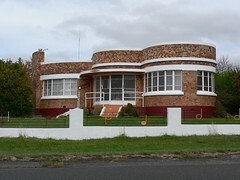 If you take you car across from Port Melbourne to Tassie on the Spirit with the plan to make your way to Hobart via Launceston along the Midland Highway you will almost certainly see Climar, this fantastic streamline house in Campbell Town. [A big thank you to Thomas at Art Deco & Modernism Tasmania for correcting my Tasmanian geographic faux pas (see comments below)]. Climar has musical notes on the low fence and a bridge makes up part of the path to the front door. Two sets of steps lead to the verandah/porch and the curving form of the house itself. I find the random variety of bricks use to build the house very interesting. I wonder if they were recycled from demolished buildings? 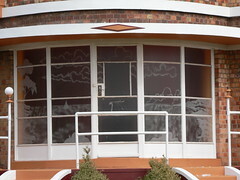 And even through a few panes have been replaced, the scene on the etched glass windows depicting a yacht sailing on a bay or lake with eucalypus trees on the shore and a trio of swans paddling in the shallows (bottom left). Great building David, but I wondered why I had not seen it in Deloraine before! 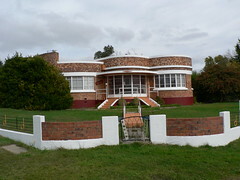 The home is actually on the midlands highway in the township of Campbell Town and was recently on the market for sale. You just cannot miss it, it's a gem of a building! Those musical notes have an important historical connection and story to them, Can pull my notes out and fill you in on them some more if you are interested. Thank you Thomas. I was trying to reconstruct our journey an couldn't remember where the house was and Deloraine looked like a likely candidate from the map. I'll change it to Campbell Town and no one will know the difference! I would love to learn the story of the musical notes. Thanks Sonia. It's a lovely house. I can imagine the attention your house attracts. It is very lovely and in a great, prominent position. Sorry to hear the etched glass scene has gone but it is good that there are others elsewhere in the house. My pictures were taken in April 2006 so it wasn't that long ago. Not sure when I'll get back to Tassie but I'll certainly check out Climar because it is one of the best looking Australian houses around. thanks for when your photo was taken, i believe the owners in the last few years did a lot of renovations which is probably when the windows got replaced. Thomas from Art Deco & Modernism Tasmania mentioned there was a story about the musical notes but I didn't get to find out the story. Thanks for filling me in.